As the first president of the Boston Baseball Association in 1871, Ivers Adams was the father of professional baseball in Boston. The Association’s baseball team was a charter member of the National Association during its inaugural season in 1871, played five seasons in that league, and then became the Braves franchise in the National League. Ivers Whitney Adams was born on May 20, 1838, in Ashburnham, Massachusetts, the oldest of six children of Walter and Sarah (Whitney) Adams.1 His father worked as a carpenter in rural Ashburnham, 50 miles northwest of Boston. Adams was educated in the Ashburnham public schools, but never attended college. Although Adams came from humble origins, he became a wealthy man in the city of Boston. Adams left Ashburnham in 1857 to pursue a business career in Boston. Initially, he was a clerk at Houghton, Sawyer & Company, a dry-goods firm. In the mid-19th century, a clerk was an apprentice businessman, who worked for very low pay to learn the business in hopes of eventually becoming a highly compensated partner in the business. Adams left Houghton, Sawyer in 1860 to be a clerk at John H. Pray, Sons & Company, which specialized in carpets.2 In the mid-1860s, Adams, still single, lived in a boarding house on Cambridge Street in downtown Boston near his work.3 Since the main office of John H. Pray, Sons & Company was at 192 Washington Street, Adams was an occasional spectator at the afternoon baseball games played on the nearby Boston Common ball field by the Lowell Base Ball Club, one of the three top amateur teams in the city. On October 4, 1866, Adams married Sarah Shepard.4 They lived in a large house with several live-in domestic servants at 2 Delle Avenue in suburban Roxbury, which had recently been annexed to the city of Boston and renamed the Boston Highlands neighborhood.5 Adams was still a clerk at John H. Pray, Sons & Company, but he was part of the emerging white-collar middle class that filled the void between the rich and the poor social classes.6 Adams still watched a few ballgames played on the Boston Common on his way home from work, since he commuted to work from the Roxbury Crossing station on the Boston & Providence railroad line, whose Boston train terminal was adjacent to the Boston Common. In 1870, when the Cincinnati team returned, 5,000 spectators jammed the Union Grounds on June 4 to watch Harry Wright’s team crush the Harvard College team, 46-15.11 Adams then seriously pressed forward to establish the first professional team in Boston. In November 1870, when the Cincinnati team was being disbanded, Adams recruited Wright and his brother George to form the nucleus of the new Boston team.12 After Adams made Harry Wright the captain of the team, Wright recruited several other highly skilled ballplayers to complete the team by the time of the ballclub’s first organizing meeting, on January 20, 1871, at the Parker House. At that founding meeting of the ballclub, Adams initiated a number of policies that were the foundation of Boston professional baseball for a quarter-century. First, he established the club as a corporation, which required that he marshal a bill through the state legislature.14 Importantly, the new baseball club was called Boston, after its city location, not by a nickname that most other teams of the era used, such as the Mutual club in New York or the Athletic club in Philadelphia. Adams used his business connections to raise $15,000 in capital by selling shares in the new corporation, convincing prominent local merchants such as Eben Jordan (founder of the department store Jordan Marsh), Charles Pierce (owner of the Baker’s Chocolate factory and future mayor of Boston), and John F. Mills (proprietor of the Parker House hotel).15 The capital enabled Adams and Wright to immediately field a championship-caliber team. The strategy for the ballgrounds was also devised by Adams. He decided to rent the land where the Union Grounds were located and build “a covered building capable of seating about a thousand people,” with reserved seats for the shareholders, members, and friends.19 Bleacher seating along the baselines would come a few years later. This location later was known as the South End Grounds, where the Boston Braves franchise played its games until 1914. Behind the capable leadership of Harry Wright, the Boston team finished the 1871 season in second place in the National Association standings, runner-up to the champion Athletic club of Philadelphia. Adams was re-elected president for the 1872 season; however, after serving as the club president for just ten months, he declined a second term since “his business engagements would not permit of his giving the proper time to the duties of the office.”20 Three weeks after stepping down as club president, Adams resigned from his position at John H. Pray, Sons & Company to start his own firm.21 His role in establishing the ballclub had helped Adams achieve the next step in his business career; cynics would say he used the ballclub for personal gain. While Adams was making money selling carpets, the Boston baseball team captured four consecutive National Association championships, from 1872 through 1875, and then two National League pennants in 1877 and 1878. Business was booming in Boston, as the baseball success had indeed helped turn Boston into one of America’s leading cities, Adams’s original goal. By the time the Boston team had won its sixth title in seven years, Adams was well on his way to becoming a millionaire as a partner at John H. Pray, Sons & Company. Adams died on October 10, 1914, in Boston.32 He is buried at New Cemetery in Ashburnham. Blumin, Stuart, The Emergence of the Middle Class: Social Experience in the American City, 1760-1900 (New York: Cambridge University Press, 1989). Devine, Christopher, Harry Wright: The Father of Professional Baseball (Jefferson, North Carolina: McFarland, 2003). Sterns, Ezra, “Ivers W. Adams,” in History of Ashburnham, Massachusetts (Town of Ashburnham, 1887), 592-594. Tuohey, George, A History of the Boston Base Ball Club (Boston: M.F. 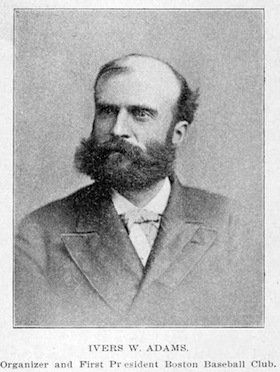 Quinn, 1897). “The Boston Base-Ball Club,” Boston Daily Advertiser, January 21, 1871. “Ivers W. Adams Dead,” Boston Globe, October 11, 1914. “John H. Pray, Sons & Company,” Boston Congregationalist, April 17, 1873. “Organization of the Boston Club as a Corporate Company,” Boston Daily Advertiser, December 8, 1871. Boston Public Library, Boston City Directory from 1860 to 1914. Massachusetts State Archives, marriage records prior to 1910. US Census Bureau, federal census records for decennial years from 1860 to 1910. 1 Ezra Sterns, “Ivers W. Adams,” in History of Ashburnham, Massachusetts (Town of Ashburnham, 1887), 592. 2 Sterns, “Ivers W. Adams,” 593. 3 Boston City Directory, 1865. 4 Marriage records for 1866 in the Massachusetts State Archives (Volume 190, Page 279). 5 Boston City Directory, 1869; the 1870 federal census (Series M593, Roll 649, Page 432). 6 Boston City Directory, 1870. 7 Boston Herald, June 11, 1869. Of the three games Cincinnati played with Boston teams in 1869, the June 10 game was the only one played at the Boston Common. In the other two games Cincinnati handily defeated the Tri-Mountain club (40-12) on June 11 in Brighton and Harvard College team (30-11) on June 12 in Cambridge. 8 George Tuohey, A History of the Boston Base Ball Club (Boston: M.F. Quinn, 1897), 61. 9 “Organization of the Boston Club as a Corporate Company,” Boston Daily Advertiser, December 8, 1871. 10 Boston Daily Advertiser, June 24, 1869. 11 Boston Herald, June 6, 1870. All three games that Cincinnati played with Boston teams in 1870 were played at the Union Grounds. On June 6 Cincinnati defeated the Lowell club (17-4) and on June 9 they defeated the Tri-Mountain club (30-6). 12 Christopher Devine, Harry Wright: The Father of Professional Baseball (Jefferson, North Carolina: McFarland, 2003), 86. 13 “The Boston Base-Ball Club,” Boston Daily Advertiser, January 21, 1871; Boston City Directory, 1871. 15 Tuohey, Boston Base Ball Club, 62. 17 Devine, Harry Wright, 12. 18 Boston Daily Advertiser, September 5, 1871. 21 Boston Daily Advertiser, January 2, 1872. A small partnership notice read: “The interest of Ivers W. Adams in our business ceases from this date. Dec. 30, 1871. John H. Pray, Sons & Co.” Adams also had no occupation associated with his listing in the 1872 Boston City Directory. 22 “John H. Pray, Sons & Company.” Boston Congregationalist, April 17, 1873; Boston City Directory, 1873. 23 Stuart Blumin, The Emergence of the Middle Class: Social Experience in the American City, 1760-1900 (New York: Cambridge University Press, 1989), 185. 24 Sterns, “Ivers W. Adams,” 594. 25 The 1880 federal census (Series T9, Roll 561, Page 482). 26 Boston City Directory, 1885. 27 Boston Daily Advertiser, June 11, 1891. 28 Directory of Directors in the City of Boston, 1906. 29 Sporting Life, June 26, 1897. 30 Boston Transcript, September 25, 1908. 31 Boston Globe, May 20, 1912, and October 13, 1912. The statue still stands today at the corner of School and Main Streets, near the entrance to Cushing Academy, a private school. 32 “Ivers W. Adams Dead,” Boston Globe, October 11, 1914.